2012 is starting to look like an exciting year. 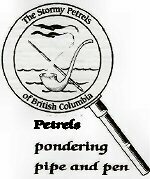 preparations are under way for the Stormy Petrels of B.C. 25th Anniversary! We are inviting Sherlockians from far and near to help us celebrate this milestone. We will, first of all, begin the year with our annual Sherlock Holmes brunch, in honour of the Great Detective’s birthday, at the White Spot (corner of West Georgia and Cardero) on January 7th. For more information on these events and general questions, please contact Fran at the Stormy Petrel g-mail address. I would love to hear from you!